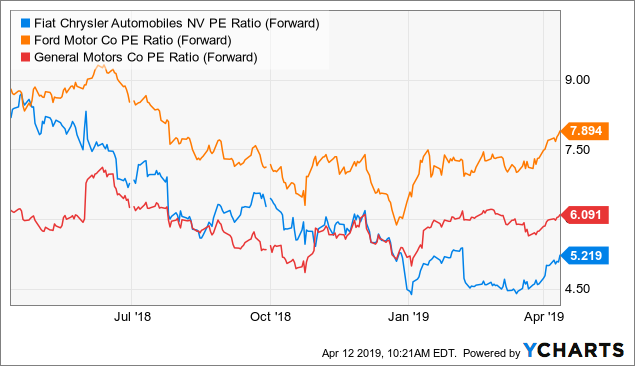 Fiat Chrysler is trading at single digits P/E ratios, gaining attention from other automakers looking for exposure in North America. FCAU is preparing to issue special dividends and regular dividends to shareholders. Industry competitors are interested in finding synergy with mergers to lower operating costs and expand market share in North America. Fiat Chrysler Chairman John Elkann reaffirms 2019 guidance at annual shareholder meeting on April 12th. Just about every day, a new story is circulated around Fiat Chrysler (FCAU) being a merger target. At the annual Fiat Chrysler shareholders meeting last week, Chairman John Elkann did not disappoint. Mr. Elkann reaffirmed the 2019 earnings guidance, and gave positive commentary looking forward to the rest of 2019. Chairman John Elkann said: “Despite the (fact that the) second part of 2018 included trade difficulties in some areas that the persisted in the first part of this year, we forecast a significant improvement in the second half of 2019." This past February, FCAU gave investors a scare as the auto maker gave weaker than expected sales numbers, along with industrial free cash flow numbers. Speaking at the company's annual shareholder meeting, CEO Michael Manley said the companies operating performance this year would exceed the record results it posted last year in 2018. Chairman John Elkann added to the conversation stating: "I am confident that we will successfully deliver on our guidance for this year," he said. Many analysts believe right now FCAU is a take over target with European and Asian automakers looking to make a sales footprint in the North America markets. Recent financial media news reports have said France’s Renault could be closely eyeing a bid for Fiat, while in March the president of the Peugeot family holding company FFP (OTCPK:PUGOY), said he would support a new deal and suggested Fiat Chrysler was among the best of options. Most significant commentary today came as John Elkann said the Agnelli family was ready to make "bold and creative decisions". This is an important detail to any potential merger for FCAU, as the Agnelli family is the most significant stakeholder. Having the Agnelli family on board is one of the most important details the automaker could pay attention to right now. When the late Sergio Marchionne pushed and created a tie up between Fiat and Chrysler, many analysts thought it didn't make sense. Now, over a decade later, most in the auto industry consider it one of the best mergers that happened. I believe Fiat Chrysler sees Peugeot as one that could fit its business model the best right now. With Jeep and Ram Truck continuing to grow, the Peugeot sedan could be a nice fit in the automakers brand line up. When taking a look at the price to earning ratios, FCAU clearly stands out among all of its peers. Lets take a quick look as well here at the YChart that shows it is the cheapest option compared to Ford Motor (F) and General Motors (GM). Any foreign automaker looking to make a presence in North America is going to look at forward price to earnings ratios. Seeing FCAU owns one of the fastest growing brands in Jeep, it makes sense industry rivals are taking notice in why shares have dropped in value along with the valuation multiples. Automakers around the globe are looking to mergers to cope with increasing competition, the rise of electrification and the threat of a trade wars. In the last quarter of 2018, FCAU continued its successful financial engineering as it sold Magneti Marelli last fall to KKR. Shareholders of record this month will be receiving a special one time dividend of roughly .65 cents/share, along with future regular dividends. The payable date for the special dividend is May 2nd. The company has suggested another special dividend payment in the future as well that would equate to roughly an 8.6% yield or so in dividend. This equates to around a combined dividend of around 1.93€ (0.65+1.28). The one thing I know about shareholder happiness is, shareholders love dividends. Even as we financiers know, dividends are not always the best route to the growth of a company, it is one the best routes to a shareholders heart. As more shareholders become open to the idea of a FCAU merger, I become more on a board with a tie up between a company like Peugeot. For what its worth, I believe what Mr. Marchionne's future plan was to make a debt free FCAU, and to one day merge with a company that could help lower operating margins. With Jeep being one of the sales leaders in all of North America, it would make sense to me to keep the focus on the Jeep brand, Ram Truck brand, and adding a sedan car component that Peugeot could bring to the table. With Mr. Marchionne being gone, his legendary vision and financial engineering skills will keep paying dividends to the patient, long-term Fiat Chrysler shareholder. Disclosure: I am/we are long FCAU. I wrote this article myself, and it expresses my own opinions. I am not receiving compensation for it (other than from Seeking Alpha). I have no business relationship with any company whose stock is mentioned in this article. Additional disclosure: Ortner Capital consults clients who currently are long-term shareholders of FCAU. Please consult a financial analyst who can review your current financial situation. These professional opinions are that of Joshua A. Ortner, CTFA, and not of any other organization.